Sarie’s owner had to leave the state and was going to take her to the pound. My husband and I took her in with hopes of finding her a home. Our landlord only gave us 30 days to do so, which only gives us until the end of June. We have 2 large dogs and 3 cats and Sarie gets along with everybody. She is gentle, kind and craves attention. She has a great disposition, very friendly and still a “puppy” in the way she wants to play. 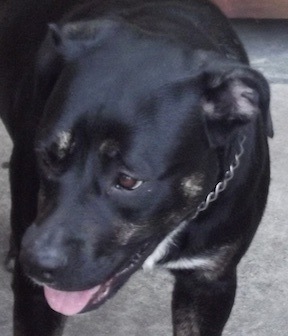 She is about 2 ½ years old, spayed, house trained and crate trained (by previous owner). She is currently residing in Ft. Lauderdale, FL.